For trees to properly grow, they need a substantial source of moisture. One of the primary benefits of mulch is that it traps moisture and condenses it for trees to access. This helps keep trees healthy and allows them to acquire nutrients for leaf development. Furthermore, mulch application traps heat which is very valuable during the hot Texas summers. Professionally applied mulch can make a pronounced visual impression on neighbors and passer-by’s. The color looks richer, the soil and grass looks healthier, and it is just an all in all aesthetically pleasing presentation for residents, and their surrounding area. Aesthetic enhancement is a primary advantage of mulch. One of the signs of a poorly maintained lawn is weed buildup. These plant growths are ugly to look at, and can also eat away at essential parts of your lawn. After applying mulch, weeds are unable to form in the soil and therefore become a threat to your lawn. 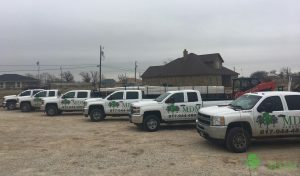 Call 817-396-0125 for mulch application in Grabury and Aledo, TX. Posted in Uncategorized on August 21, 2017 at 4:02 pm by MDM Landscapes.